MUSIC INSTRUMENT MAINTENANCE COMES OF AGE – WITH ONE APPLICATION OF SOUNDSYNERGIES® YOUR INSTRUMENT OR EQUIPMENT WILL ACTUALLY SOUND AND PLAY BETTER. We’ve solved your music maintenance problems… with music gear maintenance products that are designed to enhance sound quality and maximize performance in one simple, easy, and fast application. Total Maintenance & Conditioning for String Instruments. STRINGTone is the first string-care product to penetrate deep to the string’s core for total conditioning. One-step fast & easy spray-on application for a difference you can hear. 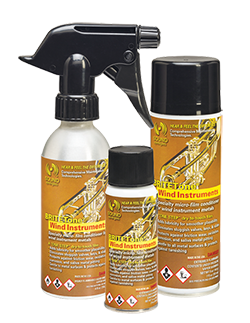 An advanced micro-thin conditioning lubricant for all brass, wind, orchestral, and band instruments. One-step fast & easy spray-on application treats all metal surfaces and components. Total drum kit conditioning and maintenance for all percussion instruments and gear. PROcussionCare micro-barrier conditioning products come in three unique formulas; WearBarrier, CymbalCare and PedalLube. The ultimate in conditioning and maintenance for sensitive electronic gear. LECTRICare is a conductive copolymer coating and comes in three unique formulas; Music Electronics, Stage Sound/Lighting and Cine & Broadcast. 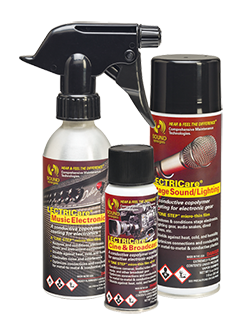 with music gear maintenance products that are designed to enhance sound quality and maximize performance in one simple, easy, and fast application. These scientifically-designed formulas also condition and extend the service life of musical instruments and electronic equipment. Eight customized formulas are available for strings, brass & winds, and percussion, plus a formula made for electronic components, sound reinforcement, broadcast video, “cinematography”, and sound recording gear. Custom formulas are available upon request. ProussionCare® with three unique formulas for state-of-the-art drum kit care and conditioning. • WearBarrier – Optimizes drum sound, extends playing life of heads, keeps brushes sounding cleaner longer. • CymbalCare – Advanced cymbal care, conditioning and protection. 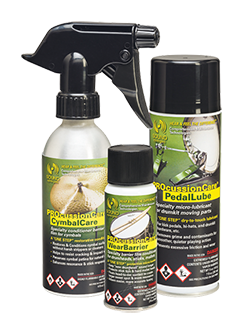 • PedalLube – The only lubricant formulated specifically for drum pedals and hardware. 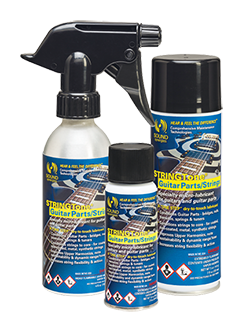 STRINGTone® is a penetrating cleaner, conditioner and lubricant for all music instrument strings, fingerboards, tremolos and hardware. Safely removes dirt, grime, oxidation, skin acids, and spent rosin from all gut and metal strings. Will not harm wood, plastic or sensitive finishes. BRITETone® offers advanced instrument care and protection for band & orchestra instruments. Conditions keypads, metals, woods, valves bores and instrument casings; lubricates keys, pillars and slides. Compatible with all valve oils and greases. Conditions all surfaces and protects against oxidation and corrosion for extended storage periods. LECTRICare® gets the job done where others fail. • Music Electronics – Conductive copolymer coating for electronic music gear. • Stage Sound/Lighting – Engineered for heavy-duty backline, stage, theater, and other sound system applications. • Cine/Broadcast – Precision lubrication and conditioning for the most sensitive components under harsh conditions. 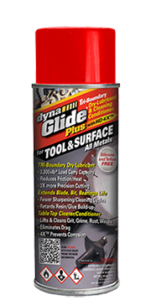 DynaGlide Plus® Tool & Surface is a tri-boundary dry-film lubricant, cleaner and conditioner for tools, surfaces and all metals.